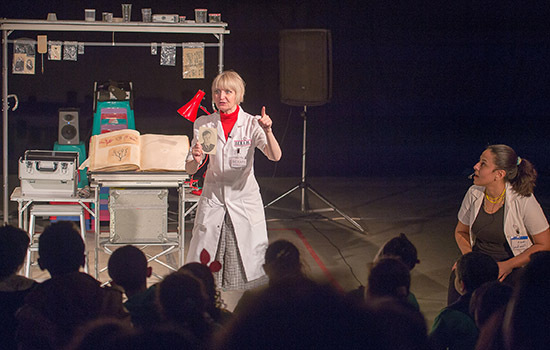 Following her performance in Cairo, Shona Reppe, the creator and actress of The Curious Scrapbook of Josephine Bean, said “Good theatre for children is essential.”The play was one of numerous performances Egyptian children and young people were offered through the seventh edition of the Hakawy International Arts Festival for Children (7-12 March in Cairo, as well as 14 and 16 March in Alexandria and Luxor, respectively). No matter how many times we talk about the importance of art in children’s education, it will never be enough. It is also important to shed light on both big and small initiatives that create opportunities for children and the young to be acquainted with theatre, music and all other forms of art. It is equally vital to encourage all artists to follow the path of those who are already active in the field of education through arts and those who simply create art for a young audience. In Egypt in particular, not only is there still much room for such initiatives but there is also a pressing need for artists to embrace the youngest audience. This is where the Hakawy International Arts Festival for Children steps in, responding to the needs of the youngest audience. The festival is organised by AFCA for Arts and Culture, whose founding director Mohamed El Ghawy sees as part of the natural development of AFCA in the field of education through art. In this sense, AFCA is one of the most dynamic players, creating palpable outreach through art and introducing artistic activities to thousands of Egyptian children from all walks of life – private and state schools, underprivileged communities – and to orphans, homeless and ill children. The Hakawy Festival one of AFCA’s youngest and most sparkling initiatives. The festival first saw the light in 2011 when it was held at the College du Sacre-Coeur in Heliopolis, bringing together troupes from Egypt, Croatia, Ireland and Finland. Ever since, the festival has evolved, testing new locations, and since its third edition in 2013 Hakawy has taken place mostly at the Hanager Arts Centre while creating dynamic outreach for children across a range of neighbourhoods, hospitals etc. Indeed, as I wrote in my profile of El Ghawy, throughout its seven-years-long history, “the Hakawy festival has brought over plays for children from 15 countries and four continents, initiated creative cooperations between Egyptian and foreign artists and engaged in dynamic partnerships with Egyptian troupes and ensembles working for or with children.” In other words, the festival’s audience grew from 800 in its first edition, held at a Cairo’s school, to several thousand in each of its recent editions. 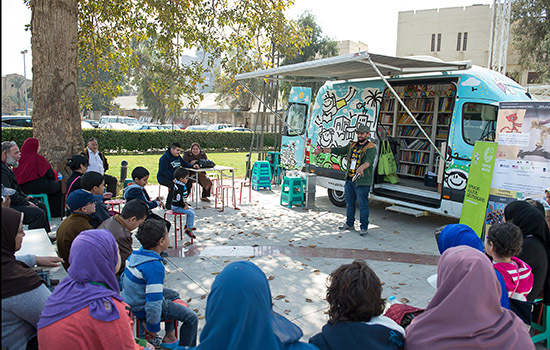 The festival’s seventh edition included performances of storytelling, puppet theatre and object theatre from Egypt, Germany, USA and UK as well as workshops for children. In the week days, between 7 and 9 March and then on 12 March, the festival focused on morning performances, giving schools the opportunity to bring over classes. A large number of children from private and public schools in Cairo, Minya and Banha, from orphanages and economically underprivileged neighbourhoods and from hospitals and associations for disabled children were brought by buses to attend the festival. During the weekend, Friday 10 and Saturday 11 March, the festival created a lively family atmosphere in the Hanager and an open area in front of it, with whole families bringing their children to enjoy the theatre. In addition to the plays staged in Cairo, attendees could also participate in puppetry workshop and other activities for children and artists. 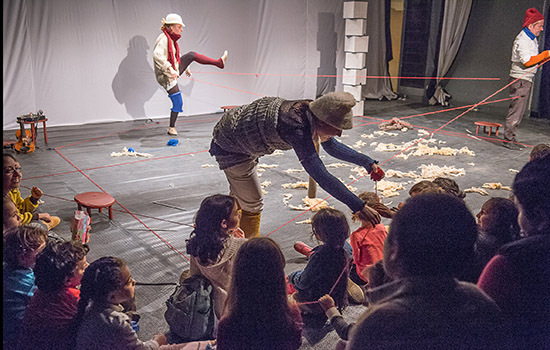 On 14 and 16 March, children in Alexandria and Luxor consecutively had the opportunity to see one of Hakawy’s plays, Follow the Yarn (Germany), in their home cities. And though this year the programme was smaller than usual — a fact El Ghawy explains by reference to the challenging financial situation, especially since the floatation of the pound last November — the intelligent distribution of the programme elements, their quality and organisation still left the audience spoilt for choice. The dynamic commotion at the Hanager was in itself impressive. There were times when, while The Pigeoning (USA) was being performed at Hanager’s main theatre, the Gallery was taken up by The Wonders of Science (Egypt). 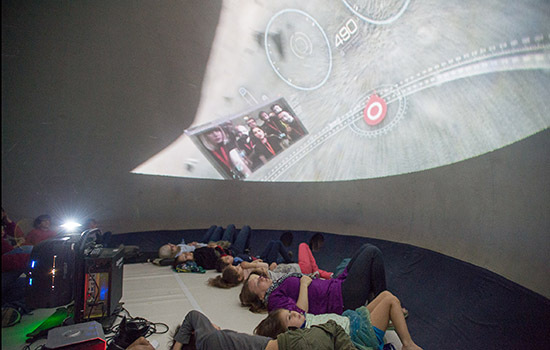 At the same time, children queued in front of the Planetarium erected in Hanager’s hall by the AUC – its contribution to the festival, which accommodated 20 children per round, taking them on a journey through the galaxy and time – while others attended an open-air storytelling performance provided by the Bibliothekbus, an Egyptian storytelling initiative supported by the Goethe Institut which brought the mobile library to the Hanager’s grounds. The festive atmosphere bubbling with boundless creativity is probably one of the major factors behind Hakawy’s success. This year science and reading were the festival’s two main themes. The first theme was particularly obvious in The Wonders of Science, the latter in the Bibliothekbus. 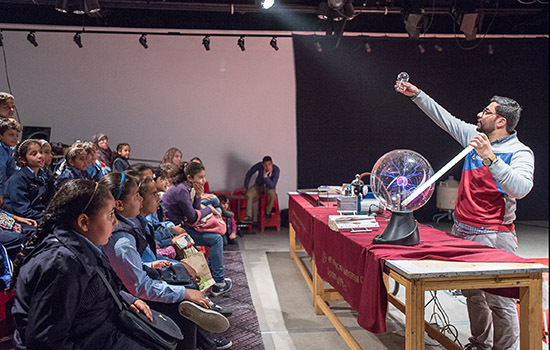 The Wonders of Science, a performance organised by the American University in Cairo, introduced basics of science in a fun and engaging way. Live experiments showcased the laws of motion, sound waves, electricity and magnetism, and invited the children to interact. Different kind of discoveries were made through three remarkable shows, from the USA, the UK and Germany. The Curious Scrapbook of Josephine Bean by Shona Reppe (UK), the provider of the opening quote for this article, ignited the children’s imagination and invited them to think, while providing a lot of fun. In it, the audience, or rather “the scrapets” as the protagonist Dr Patricia Baker (Shona Reppe) calls them, follow the investigation of the magnificent scrapbook that belonged to an old watchmaker from the Victorian era, Artemis J Mood. As the story evolves, and together with Dr Baker, the audience connects bits and pieces that lead to understanding who Josephine Bean was. 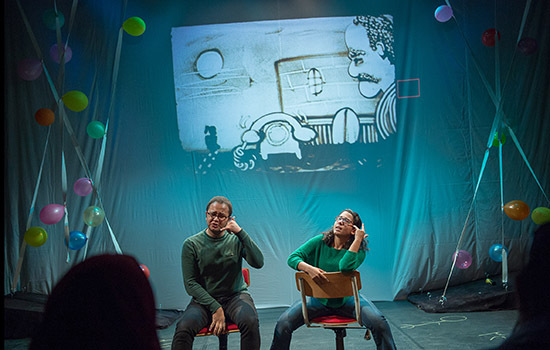 The UK play relied in large part on language, and since English is not first language of the young audience in Egypt, Shona Reppe introduced a translator. However, instead of adding a dry translation, Isra Ghazali, an Egyptian actress, became Dr Baker’s assistant seated on the stage. While translating the text into Arabic, together with the audience, the assistant was surprised, thrilled or puzzled by the many discoveries made by Dr Baker. It is a new practice of El Ghawy’s to bring shows that require translation and previous editions hosted mainly performances where the message was delivered through dance, movement or pantomime. As El Ghawy mentioned during the first day of Hakawy, this year he selected quality shows regardless language barriers, which were dealt with in a creative way whether in The Curious Scrapbook of Josephine Bean, The Pigeoning, a show from the USA or elsewhere. In The Pigeoning, the recorded voice of an Egyptian narrator walks the children through the puppet show created by Robin Frank. The protagonist, named Frank, an obsessive compulsive office worker in huge glasses, possessed by cleanliness and order, is convinced that pigeons are plotting against him. His struggle to protect himself from pigeons, understand and eventually befriend them provides an insight into the contrast between nature and the four walls of a clerical office in a busy city where there is little room for self-reflection. At the heart of this bittersweet story is the life of everyone trapped in an urban environment, where the only contact we may have with nature is translated through pigeons. 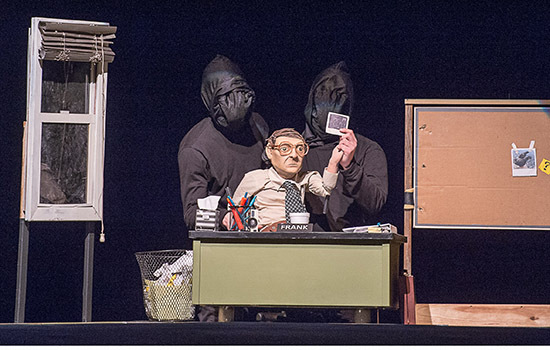 As much as the story is made for young viewers who quickly sympathise with Frank – the puppet, it is equally absorbing for the whole family, inviting a reassessment of our taciturn lives versus the many voices that nature can offer. Seemingly much simpler was Follow the Yarn, a show from Germany’s HELIOS theatre targeting children as young as two years old. While there are three actors on the stage, the show’s main protagonist is the yarn. The yarn takes on many qualities: it is part of a sheep personalised by the actors, it is jumbled when they play with it and tidily wrapped when they use it for knitting. It is the source of all the clothing we wear but, as we soon discover, it can carry social elements too, when it is stretched to every member of the audience, creating woollen tracks that join the children together. There is something very unique about shows for toddlers, which are usually very different from plays for viewers aged six or older. Toddlers lose interest fast; they prefer a simple storyline, few puzzles and clear direct messages without patronisation. They enjoy the wrapping together of language and sounds, music and songs, and clever repetitions. Like all children toddlers like to be addressed directly and engaged in the play. Follow the Yarn offered just about everything, keeping these very young viewers interested for its 45 minute duration. A much older audience was targeted by two Egyptian plays, both relying on the involvement of children and/or youth in their creation. 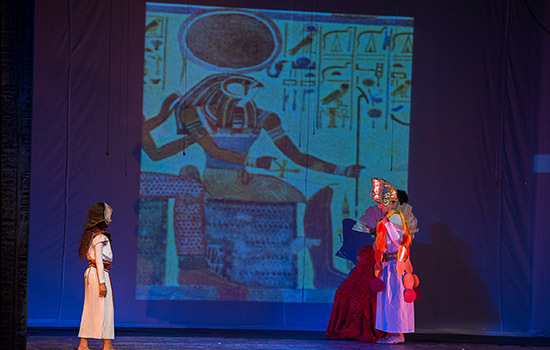 First was Tales of Ancient Egypt, performed by the Young Scholars of Egypt. The play consisted of three short plays written by students aged eight-14, based on Roger Lancelyn Green’s short stories collected in a book with the same name. The second play, titled Nour, was produced by AFCA and addresses an audience aged 15 and older. It is a play that welds storytelling, amateur energy and ideas with professional theatre components. As we read in the programme notes, the play is part of a larger project that includes collecting stories from young people aged 15-25 through workshops held in governmental schools, associations and universities across Egypt. Over two years, young people spoke of their real life experiences and reflections. A collective work all the way through, it involved four boys and girls from the group aged 18-25 (Mostafa Mohamed, Lina Sakr, Menna Waleed and Perlina Ashraf) writing the script and music, designing the scenography and directing the final play. They were supervised by a team of professionals: Baher Dewidar in scriptwriting, Mohamed El Gharabawy in scenography, and Mohamed El Ghawy in mise-en-scene with assistant stage director Khadija El-Dessouky. In the performance, we find Nour and Nour, a male and a female character, who despite sharing the same name are divided by many differences resulting from their gender as well as by the expectations, hopes and restrictions placed on each of them by society. However, despite those differences, Nour is an everyman story about living in a society governed by societal, religious or traditional requirements. We follow Nour from the time his/her parents met, fell in love and got married; then we see Nour as a child, adolescent and a young adult. The reflections on the family, individuality and society, are supported by statistical data braided into the script. The simple scenography underscores the double-protagonist while the sand artist Michael Romanycreates captivating drawings of spaces and emotions, presented to the audience with the aid of an overhead projector on the screen. Engrained in the realities of Egypt, Nour speaks to the audience by exposing reality or simply by raising awareness. And while the play includes a presentation of sheer facts, some surprising, others shocking the viewer, it is also an interesting theatrical journey packaged in a well-balanced creative vocabulary. There is no dogmatism, no forcing of opinionated messages onto the viewer, and no calls for specific actions — a trap into which many such productions fall. The play trusts the viewer to judge the necessity for taking action and eventually to do what is needed, whether in their own household or on a larger scale. The play, like art in general, does not provide solutions; it rather invites the viewer to step back and reflect on their social and cultural surroundings. Following one of the performances, the audience members eagerly shared their impressions of the topics developed in Nour, emphasising the need for the performance to be presented to a wider audience. Is there a more obvious proof that the aims of the play have been accomplished? Nour is an experience and an ongoing process. As the programme notes reveal, the performance is yet to tour Egyptian cities where it will definitely generate more discussions and further reflections. It is also through this ongoing process that the director will continue looking for stronger formula to package all the energy of the amateur performers with creative ideas into an aesthetically engaging work. As I have mentioned, this year, the Hakawy International Arts Festival for Children brought a smaller a variety of performances. They were however unique in their approach to the audience, targeted different ages and invited to different levels of discussions.